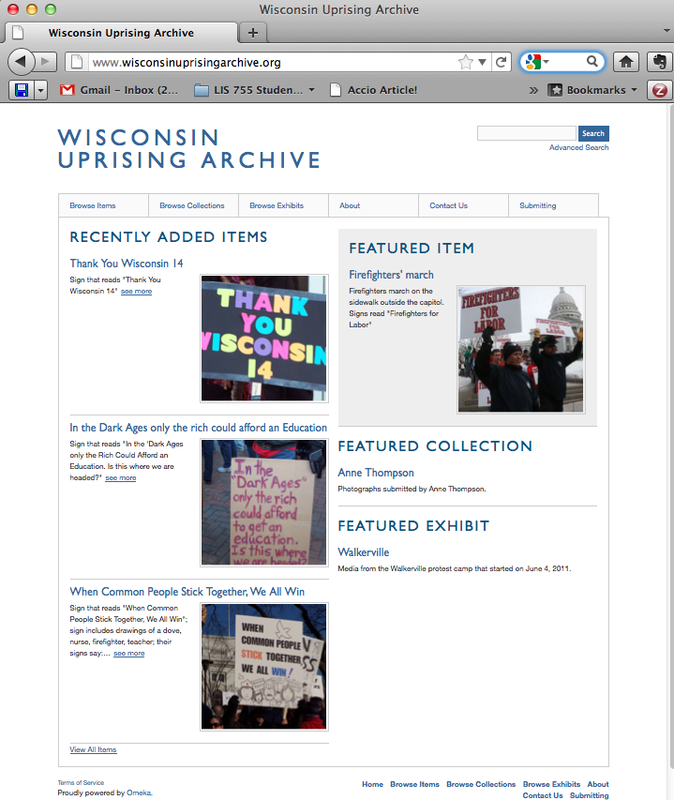 Posted on November 21, 2011 March 4, 2015 by Sarah R.
The Wisconsin Uprising Archive, a digital repository for material related to the Wisconsin Union Protests of 2011. The paradox of digital material is its ability to disappear: despite a potentially infinite lifetime and no degredation of quality as suffered over time by their analog media counterparts, digital objects are only as good as the ability to find them – to avoid, in essence, digital ephemerality. These are themes that are not unfamiliar to those who work in digital archives or in LIS, in general, and those attuned to such issues who have also been active in the recent digital-media informed new social protest movements have seen this digital emphemerality for the problem it is. For example, the Wisconsin Union (#wiunion on Twitter) protests of early 2011 produced a wealth of born-digital documents and material, subsequently scattered across the digital landscape and subject to the personal archival practices of the people who created it. You can find this material on YouTube, Vimeo, Flickr, or on the private Facebook accounts of any number of the multitude of protestors involved in the events – as long as you know where to look. In the latter case, if you’re like me, your collection is behind a privacy barrier and in a heavily-curated account, where only “friends” can access the material. In the worst cases, the digital video and photos are still sitting on a flash card in someone’s Flip cam or iPhone, waiting to be uploaded but frozen in stasis and on the To-Do list that never gets done. 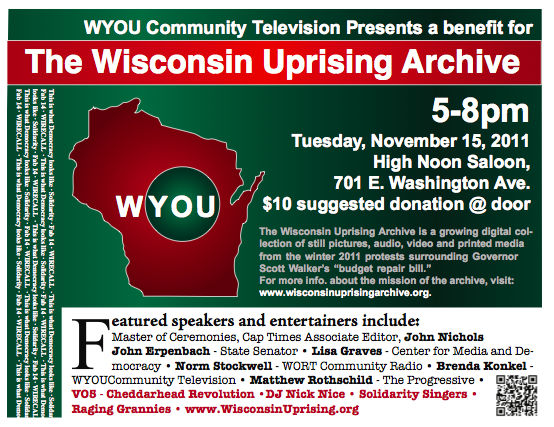 A flyer from the recent kickoff event for the Wisconsin Uprising Archive. In yet other cases, there is a plethora of physical material – hand-outs, flyers, posters, etc. – that is not yet widely easily available or may not exist in digital form and runs the risk of disappearing altogether if it is not curated and digitized. I have saved countless handouts from the TAA, the WEA and other organizations that fits this bill and have anxiously looked at it stacked in a forlorn corner of my desk, wondering when and how I’ll get around to dealing with it. 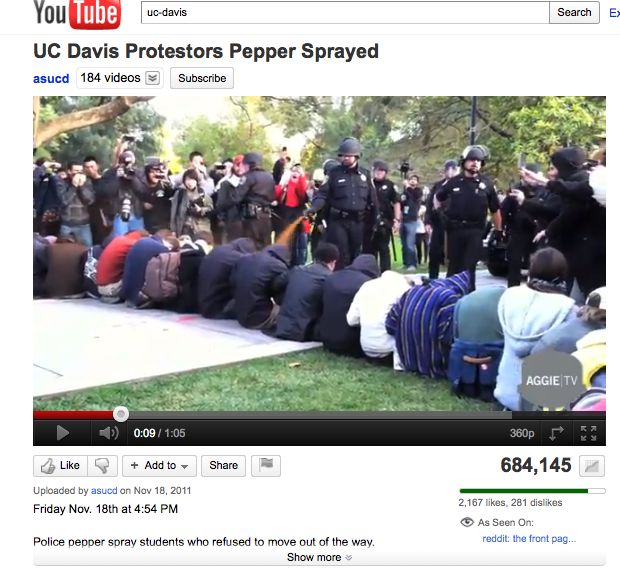 A UC-Davis police officer pepper sprays docile students in the face, in this video posted to YouTube. Indeed, just as Wisconsin’s uprising of the spring served as a prescient springboard for the social justice protests that have spawned since around the country, so, too, does this Archive serve as a foreward-thinking and necessary companion to the protests as they happen. Not only do they serve to document the vast array of people-created media from the on-the-ground activities, allowing researchers and other interested parties to deal with primary-source materials when working on projects related to the events, but it gives a rare non-corporate outlet for people to contribute and house their materials. This is no small feat, in an era where most everyone’s go-to distribution channel of choice is a deeply corporate enterprise whose privacy and other practices are outside the control of the users, with voracious intellectual property appetites that often demanding the surrendering of user ownership of material in perpetuity. Is that truly the best outlet to document social resistance movements? Furthermore, with user-generated social media increasingly thrust into the spotlight as one of the few power-leveling mechanisms available to protestors, being able to house and preserve digital media in this way will continue to grow in importance. This week’s shocking video from UC-Davis capturing campus police using pepper spray on seated Occupy students (and the subsequent powerful video of Chancellor Linda Katehi walking past throngs of silently-protesting students without comment) is only the latest example in which on-the-ground, organic media created by participants in resistance movements continues to send shockwaves around the world. Indeed, this particular clip sparked outrage throughout the country and the Police Chief of the UC-Davis police has been put on leave. A the #OWS movement grows and other social justice movements continue to document their struggles using participant-generated digital media, the need for projects like the Wisconsin Uprising Archive will continue to grow. With luck and with coordination, this project can serve as a model to other people and movements around the country, who undoubtedly have a similar need to preserve and document this history in the making.